^ "La Biennale di Venezia – The origin". 7 April 2017. Retrieved 9 September 2018. ^ a b Taillibert, Christel; Wäfler, John (2 January 2016). "Groundwork for a (pre)history of film festivals". New Review of Film and Television Studies. 14 (1): 5–21. doi:10.1080/17400309.2015.1106688. ISSN 1740-0309. ^ a b c d e f "ASAC Dati". asac.labiennale.org (in Italian). Retrieved 29 November 2018. 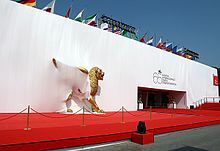 ^ a b c d "History of the Venice Film Festival". 7 December 2017. Retrieved 9 September 2018. ^ Shoard, Catherine (25 July 2018). 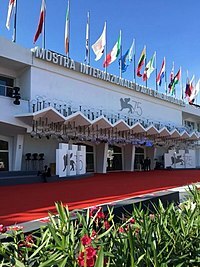 "Best program ever: Mike Leigh, Coens and Cuaron set for Venice film festival". The Guardian. Retrieved 9 September 2018. ^ "Venice Film Festival winner list". Variety. 8 September 2018. Retrieved 9 September 2018. ^ "Carnival of Venice, Marcello Mastroianni Award". Carnival of Venice. Retrieved 29 September 2014. ^ "Carnival of Venice, Portale di Venezia® – The 1930s". Carnival of Venice. Retrieved 29 September 2014. ^ a b c "La Biennale di Venezia – The 30s". Retrieved 29 September 2014.